After the shocking murder of the Reverend Hewitt, Kate Hewitt wants desperately to return to the mysterious, fog-shrouded Queen Charlotte Islands in British Columbia to discover who killed her father. Although she had grown up running wild among the Haida Indians to whom he ministered, she is now trapped in the far more civilized world of late 19th century Victoria, where women are forced to live circumscribed lives with no purpose but marriage. Her skill as a photographer is an embarrassment to her aunt and uncle rather than a source of pride. Given the opportunity to return to the islands with a museum expedition, she gladly risks her reputation and even her life. Driven by his own passion for saving any remnants of the Haida’s dying civilization in his museum in Boston, Luke Brennan soon comes to repent his unusual decision to employ a woman to travel with him and record dances and ceremonies in photographs. Had he guessed at this woman’s dangerous intent, he would never have been so foolish. For he lives already under the shadow of guilt – a man unusual for his time, he had allowed his wife to travel with him on similar expeditions, and blames himself for her death. The frightening journey over stormy seas does not quell Kate. Her probing questions bear fruit all too quickly: an attempt on her life. Her father’s killer could be anyone: the missionary who had been subservient to the Reverend Hewitt but who has now taken his place and yet seems to despise these damp, isolated islands and the people to whom he ministers; a miner who is the only man who had ever told Kate she was pretty, but who admits he came to this godforsaken place to avoid being hung for murder; white men far more ruthless than Luke who also seek to buy the totem poles, masks and more from the Haida Indians; and perhaps even Kate’s childhood friends among the Haida who make her painfully aware she is not one of them. 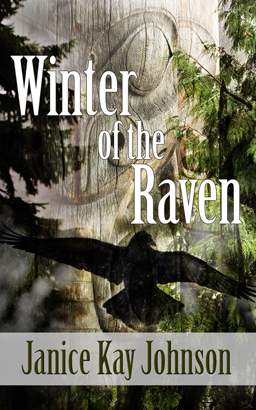 Kate and Luke’s winter-long journey is melancholy, with them torn between the need to salvage what remains of a dying culture and their awareness that, for all their good intentions, they are hastening the death of the culture with each ceremonial mask they buy and take away. As Kate and Luke with their two native guides circle these magnificent islands through the storms of winter, they are accompanied by death, grief, passion and the chance to create bonds that offer hope for a future…if the murderer who also pursues them does not have his way.